Segundo boss de la cumbre del vortice, suelta una montura muy wapa. Este boss es soleable por un dk , hunter y puede q otra clase. Este jefe en modo heroico se puede farmear una montura. Requisitos: Para hacerla solo nivel 90 y se puede solo una vez por día. 1) Establecemos la dificultad del calabozo en modo Normal. (MUY IMPORTANTE!). 2)Hacemos el calabozo hasta Altarius y nos fijamos si obtuvimos la montura. 2.1)Si este es el caso, festeje y compartalo con los amigos/hermandad y el reino en general si asi lo desea. 3) De no haber recibido la montura debemos hacer lo siguiente, nos tiramos por el borde de la plataforma, de forma que nos transportemos nuevamente a la entrada de la mazmorra. 4) Salimos, damos click derecho en el retrato de nuestro personaje y clickeamos en "Reiniciar todas las instancias" (Nota: Si en el chat sale: "Se ha reiniciado La Cumbre del Vortice", este paso fue exitoso). 5) Repetir paso 2 a 4 hasta que se cumpla el paso 2.1. Aquí una guía espero les guste. He drops the Reins of the Drake of the North Wind at an assumed 1% chance on Vortex Pinnacle. It DOES drop from the normal version of the instance, not only heroic. 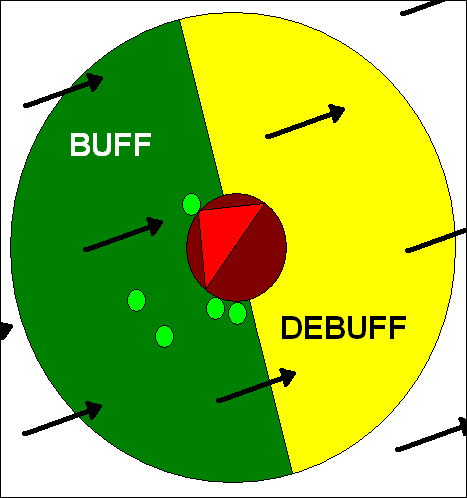 When the wind shifts, players should move so that they are upwind of Altairus for a buff. DPS and the healer should not stand by the tank, or they will get breathed on. Tank stands downwind from the boss in the middle of the room, facing him away from the group. The group should move to be at his back for a nice buff. Confirmed this! Dropped off the boss yesterday on a normal run while leveling and to be honest, now I'm pretty annoyed that I didn't win it. Tank and spank. Tank simply needs to strafe and turn the boss periodically. The boss will randomly change the direction of the wind. DPS and healer will want to stand with their back towards the wind, while the tank will want to stand with their face towards the wind. Boss will randomly pick targets and cast Chilling Breath - this is unavoidable. Heroic mode has a bunch of tornadoes flying around. Pan your camera down and avoid the tornadoes, they shoot you in the air and can greatly disrupt the fight if you're a tank or healer (and make you eat a breath). When he does cone AoE, spread out as he will target one group member at random. Like the thread above mine explains he will spawn about 20 whirlwinds that throws you up in the air if they hit you. I found them easily avoidable. He also targets a person and breathes anyone near him with aoe damage. Other than watching out for the breathe and the cyclones, this is just a tank and spank fight. Don't bother dragging him to the ramp to avoid the tornadoes. He zaps you for 100 billion damage. Be careful for the tornadoes, catching one in a bad position can fling you off of his platform and he will then instantly kill you. On heroic, hunters can use Aspect of the Fox here to keep up the Improved Steady Shot buff or to keep shooting Cobra Shot, cause this fight can involve a lot of moving. No need to downrate a useful post people. In addition to his other abilities, he apparently has a hidden "destroy UI" ability that throws LUA errors every time you're about to fire teh lazors or somebody is close to death or pulls aggro or breathes wrong. HUNTERS Use Disengage in mid air to get back onto the platform if you get thrown off. i just did it and i was like holy $%^& did i just do that? This is one of the funnest bosses in the game as a ranged dps. Not knowing any of the heroic changes and then seeing all those tornadoes pop up is just a sight of beauty. Mages can blink when thrown up into the air via tornado to prevent falling off the ledge and therefor the boss insta-killing you, in addition to the feral leap, intercept, disengage, etc. Although there are 25 tornadoes covering most of the platform, their radius of hitting you is actually quite small, maybe 3 yard radius. Regardless, it is very important to not get hit by them, because you can be thrown in the air, land on another tornado, and be chain-vortexed off the edge, and insta killed. Heroism/bloodlust and the wind buff will probably be wasted for dps casters, I know that I am almost GCD capped with just the fight buff in avg-ilvl 338 gear. If the heroic run is smooth, might want to save hero for Aladdin's Genie boss later. For the 'clicky orb' achievement for this instance, you need 5. Sometimes there is an orb above this boss platform, but don't try to get it, there are other orbs you can get to acquire 5 without risking a boss fight death. Avoid the tornadoes, they will knock you around and damage you. If you get knocked off the platform, you die. If you get knocked downstairs, you will obviously be out of LOS for healing. Watch out for his breath, if you see him turn around and begin breath on someone else than the tank, move out of the way. Don't ever run in front of him. When the wind starts blowing, make sure that the boss doesn't cover the wind for you. I've read all these other complicated explanations, but it's really just that easy. If the wind blows at you directly, you will get a buff that increases your cast/attack speed. In the absence of this buff (that is, if you are behind the boss and get no wind blowing at you), you will get a horrible debuff that does exactly the opposite - slows your cast and attacks down. The tank needs to consider this as well, because you will need the buff for threat. The tank needs to face the boss directly towards the wind direction, because in that position, the boss will cover the least wind possible, and people will have to run a shorter distance if they are in a position where they do not catch the wind. This boss is *fun* for Ret Paladins. Sanctity of Battle during Upwind, whee! Aspect of the Fox isn't a pvp only ability, and it shines on this fight. As a hunter, just stay on the small steps with your camera facing the ground, zoomed out. Then, with AotF on, it's just a matter of moving away from tornados and being up or downstream. Easy fight, not much stress for the healer except for breath. True. Saw it drop on normal as well. Okay, here's something for you people to test out. During the fight I got hit by the tornado and I noticed these orbs in the sky. You can loot them and on the top it will say "Golden Orbs collected: 2" I found 2 orbs on this fight but have no knowledge of the use of them. I don't get anything in my bags, and nothing gained on a buff bar. Just brought him to 3,5kk hp in 2 minutes... Then the full party wiped except the Tank (me, yay!) and the Healer (both Paladins). The fight lasted 8 more minutes but he went down! Rate this guy up for truth and read the part after the third red dot! TLDR for healers: If you think of the boss as a square, position yourself at one of the square's corners to make it very easy for yourself getting the upwind buff. On heroic mode as a feral druid or subtlety rogue, I advise people not to use shadowstep or feral charge, as there is a chance you will bounce to the boss, land in a whirlwind, and then bounce out of the arena again and get oneshot. This probably also applies to a warrior's charge, mage's blink... Basically, any sort of movement where you can't exactly control where you end up. Edit: Re-entering while the fight is still going gets you oneshotted the moment you enter the portal. Not sure if anyone else has mentioned this, but I'm too lazy to read all the replies. Edit 2: As feral druid (and I assume warriors too) you can occasionally mash the charge button and charge back to the boss before you fly away on a cyclone. I assume this works with Shadowstep too. Warlocks can probably use their teleport-y thing. As said elsewhere here, Hunters can spin around and disengage back onto the platform mid flight. It's probably also possible for a priest to use Leep of Faith to drag people back. Essentially soloed this boss on heroic earlier as a blood tank, although not intentionally. The healer and 2 dps flew off the edge and died almost straight away, and the mage survived a little while longer before eventually dying to breath/cyclones. My tanking ilvl is roughly 348-350, and I have 144.2k hp unbuffed. The trick is to make sure you're getting the upwind buff and constantly DS whenever you're hit. He dosen't melee too hard, but his breath will do a good chunk of damage. Make sure you save your defensive cooldowns (AMS, IBF, VB/RT, Lichborne/Death Coil spam and Ghoul/Death pact) for breaths to minimize the damage taken. Prepare for a long fight, I death pacted at least 4 times. Blood tap whenever you get low and don't have the runes for a heal - I found myself at 3-4k a few times and without runes, and the blood-tap was a lifesaver in these spots. I'm pretty confident I could do it again if I wanted, as could any other competent and heroically/rep geared blood tanks. Also, your party members will be insta-gibbed if they enter the instance while you're still fighting him. Confirmed, I think I got my realm first, but wouldnt bet. For clarification, because I find such terms as "upwind" and "downwind" rather vague. Everyone else: wind at your back. This has NOTHING to do with facing or with the boss "blocking" the wind like a line of sight object. It is all about where you are in relation to the boss and wind direction. You want to position yourself so the wind hits you first and the boss second, that is the definition of "upwind". Imagine that the boss has a terrible odor coming off him and you want it to be carried away from you on the wind. If you are DOWNWIND, then the odor is carried from the boss to your nose and it makes you sick, therefore you get a debuff making you slow. If you are UPWIND the the odor is carried AWAY from you and you get a buff. The boss does not cleave, so the tank may face him in any direction he wants so that he also gets the buff. Additionally, the boss will randomly target a player and breathe a frost attack toward them, this breath is a cone from the boss to the player, it will hit the target and anyone near him so it is best to spread out. This is a frost attack so frost resistance helps. It is also an AE so rogues can feint to take 50% less damage from it. If you choose to stand near the edge of the platform do not get hit by a tornado, if you are thrown off he will shoot a lightning attack at you for ~100k damage. If you are accidentally thrown off hug the wall of the platform as you run back around to go up the stairs and he may not shoot you. A tip for tanks - If you taunt him when he turns to cast his breath on the group you will take the damage. He will still turn and cast it on someone but if your taunt is on him you will take the damage. Makes this fight much much easier to heal as people will only take damage if they are standing by the tank, which they shouldn't be. The healer then just has to spam the tank and not the entire group. Frost Resist Aura helps a ton on this fight. The dragon smells. Don't be in his wind. Well, if the comments are true about this boss lacking a frontal cleave, then what's the point of only the tank getting the negative debuff? Seems like too many people are basing their strategy on those youtube vids made by those British dudes. Tanks do a lot of damage now. So they should be standing upwind as well in order to get the haste buff in my opinion. It would make it easier for them to avoid cyclones. Also, it seems the key here is for the random player targeted by his breath ability to at least try to move away from the rest of the party. And tanks are not invincible on this fight. They should try to avoid them as well. So if you have everyone on the same side of the boss, all getting the haste buff, it would make it easier for the person targeted by the breaths to either run through the boss or away from the rest of the group, including the tank. Reins of the northwind drake do drop in normal. Just happened today in PUG group. We found the difficult part of this fight is avoiding the tornadoes. Changing camera angle may help. I did it tanking him with my back to a wall, so I couldn't get blown off the platform. This worked, but it's probably not optimal, as it makes it hard for the rest of the party to position themselves up-wind. - Especially in pugs where people's skills can be questionable, anyone who is competent or knows the fight well should get a mark so the others who are new to the fight or to be blunt, clueless, can follow them around. We had 2 dps new to the fight and I marked myself as healer. They followed me around and made life much easier. Make sure to tell them to watch for tornados on their own. - As much as you may want to rush in to get positioning, let the tank ranged pull so the tornados spawn. On one attempt, I had a tornado spawn on me, which led to chain juggling me off the side. - Frost resist aura/totem! Combine that with taunts from the tank and it really trivializes the breath weapon. - Do not set the camera right overhead into a top-down view. The tornados lose a lot of their visuals this way (being as they are hollow) so you will be better served with a lower angle. Once you get this fight down, heroic Vortex Pinnacle is a loot pinata. The first boss just requires aoe heals with everyone stacked on the boss the whole fight and the third boss requires a competent dispeller and players to stand in a triangle every so often. For the initial pull the tank pulls the boss towards the center, turning the boss to face the direction it was pulled from, DPS and heals spread out in a semi circle around it's flanks and rear, preferable not to far from the dragon. Once the fight begins the everyone stays in place only moving to avoid a tornado. IGNORE THE UPWIND/DOWNWIND buff. By doing this a lot of damage from the dragons breath will be avoided as it will only ever hit one or two players making the fight much easier for the healer. With less spiking damage the healer can safely heal with instant spells when stuck downwind and use spells with a casting time when upwind. Likewise with the DPS. With this strategy there will ALWAYS be some party members with the buff and some without so the fight should move along steadily until the dragon dies. While I agree this might not be the most "Efficient" way to down him, with a PUG it is the safest, not to mention the way that has gotten me past him more times then not. Tank pull dragon to center, face him away. DPS and heals spread out evenly around the boss. Only move for tornadoes, do not move for Upwind/Downwind buff. You know what is expertise, right? You are positioned in-between him and the general direction that the wind is blowing from. All anyone needs to do it move a couple yards each time the wind changes direction and you're sorted. Aside from the Assassin's Creed 1 reference, Altaïr means Eagle in Arabic. Since he's a dragon... and a part of the Vortex Pinnacle, a name referring to a flying animal in the sky and a part of the wind makes a lot of sense. This fight is the bane of existence for hunters. While all melee/casters can stand right on top of him to dps, and thus move only a few steps to maintain the speed buff, hunters have to contend with his enormous hit box, which can take up to 50% of the platform. In order to even try to dps during this fight, ensure that you are using Aspect of the Fox, since nearly the entire time you'll be traveling against the wind to correctly position yourself. I really wish they would fix the deadzone on this guy. It's ridiculous. I keep seeing a very common misconception about Altairus. Wind direction has nothing to do with what way the dragon is facing. You do not have to be behind him. I have stood behind the tank and still been upwind. Blizzard is fixing this in the patch, and I suppose it is possible the animation does not show if you have lower graphics. When the wind is blowing you will see white lines above you. If they are going from north to south, for example, you want to stand in the north. You will also have a debuff that said Upwind or Downwind, depending on where you are standing. I would suggest investing in an addon that makes your debuffs more obvious than having to mouse over the blizzard UI one. They have the same picture. Something healers always seem to miss on this fight: the casting speed debuff works for you, too. Meaning, you need to be upwind of the dragon at all times, or your heals go off slower. I've seen plenty of healers just stand there and ignore the debuffs, and most of them can't keep up when they're downwind. It's more important for healers to stay upwind than DPS! Remember that and you'll do your party right. #1 priority here is to stay alive. Forget about putting your back to the wind, except healer. (Healer should try to keep back to wind.) What kills ppl and wipes the group is his chilling breath. His breath is a random cast towards one person in the party, but it hits everyone near that person too. So everyone spread out so only 1 or 2 ppl get hit with breath at a time. #2 priority is to avoid the tornadoes. You'll be moving around a lot to do this. When you can, try to stay away from other ppl, again because of the breath. It's not a dps race. It's about survival. If tank or dps happen to get wind at your back, great, but don't focus on it. Tank him in the middle so if (when) the tank gets thrown by a tornado, he doesn't get thrown off. Anyone thrown off cannot rejoin fight. Hunters, go up the steps to get range. Boss has huge hit box. This is the definition of a badly designed fight. It's only hard because the tornadoes are so hard to pinpoint. Last night I was fighting this boss. At the beginning of the battle, when the tornadoes instantly appear, I was thrown up into the air (nothing I could do about it). It threw me into another tornado, which threw me out of the room. Then the boss one shotted me. Absolutely no getting around it :( but the other 4 people still killed the boss. stand on the side of the stairs, theres 2 room for one caster each. (see screenshot, if its still loaded), my hunter is right where i should be, i get hit from NO tornados whatsoever. it takes more time if you get unlucky with wind but the other caster on the other side of the stairs can compensate for that. our healer finished with 40% mana, no use of cds. easy shot. And we're not that geared so its really easy. The skyshard ring drops on normal aswell. am i the only one who saw this & thought TPED. Confirmed that the article for this boss is wrong. The direction your back is facing is meaningless. It's all about position, not the way you're facing. To get the "upwind" buff, you must actually be upwind of the boss. Not sure of anybody has noticed or not, but you CAN pickpocket this dragon. I had been soloing this place a few times before when I was bored as resto, as that was the only spec I could get through the 2 bosses with before (but it was looooong fights, 12+ mins). It had been a few weeks since I tried so I decided to give both moonkin and feral another shot at it and I can get through it now. I've been playing every spec of druid for 10 man heroic progression so far so I have decent gear for each. My moonkin set is full epic 359, and my feral set is MalevolenciaBotas de jinete de la tormenta + 2 cat trinkets + blue neck. The rest is 359. For my specs I didn't change anything from what I'm using for raids currently. For both bosses I ate standard DPS food + used a Elixir centelleante with Mark of the Wild up. I did the first boss as moonkin, but never actually went into that form. Just kept up LBx3 + DPS'd as I could, using barkskin for when he pulls in his shield and I had to run out. It took a few tries to get, but the key is definitely timing barkskin + my engineer belt absorb for the right times and maintaining a 3 stack of LB. Previously I didn't keep the LB up full time and I was running OOM having to spend too much mana on Healing Touch. Now for this guy, Altairus, I went feral. I tried it as moonkin but his melee hits were too much to heal through without going OOM, and he crit me a few times for over 40k. As feral, it was pretty simple. After looking at the damage incoming from the first pull as feral, I noticed that 75% of my damage incoming was the breath, so I came up with this. Leader of the Pack + mastery absorbs will heal through all the melee damage and then some. In fact my mastery absorbed 2/3 of his melee damage. So the key is to make sure you use cooldowns as often as you can for breaths. Barkskin the first, Survival Instincts the second, belt absorbed the third and used them as they came back up again for breaths. Save Frenzied Regen for when you hit about 30% HP and make sure it isn't glyphed. If you stay upwind of him, the hasted melee swings will make sure your rage stays topped off so you can pretty much keep a normal rotation and get max heals from Frenzied. After the first tick of the breath I did pop out and put a single LB up once or twice and got back into bear form, but I don't think it mattered much. All said and done I took 262.7k damage from breaths and 87.4k from melee swings. LotP healed 196.7k, Frenzied Regen healed 64.7k, and mastery absorbed 165.5k. I've found as a shaman healer it's actually easier to not move at all, and just deal with the buff as it comes. As you're walking up, imagine the circle as a clock. At 3 o'clock there's an area that the tornadoes avoid, so you can stand there. Keep an eye out to make sure you're in the right place. If you get the buff, cast Healing Wave over and over. It's cheap, efficient, and fast due to the buff. If you get the debuff, instants are your friend. Riptide, Earth Shield, Unleash Elements, and Water Shield should all be used/refreshed during this debuff period. After that, Healing Surge (especially after Riptide) is a good idea, as it will take a little longer, but its low cast time makes it manageable. If the Healing Surges are working your mana or the dps is a little low, don't be afraid to drop a Mana Tide totem. And as others have mentioned, Elemental Resistance Totem is useful for this fight. I imagine the above advice (buff-efficient heals, debuff-instant heals) would apply to other healers as well, not just shamans. Getting the buff in this fight is AWESOME. On my enhance troll shammy, with the buff alone I was swinging soo fast it was like I was a character from Dragon Ball Z! xD Also...rogues can pickpocket a stomach from this boss..? Normal mode of this boss pretty much soloable by well geared (my current iLvl 358) Death Knights. I just did but I needed my guildies to clear the path. I love this fight as an MM hunter on heroic. Upwind + Rapid Fire + Hyperspeed Accelerator + ISS + Heral of Doom Proc = Near instant Aimed Shots crits. Pulling 60k+ DPS easily for a little while. The first two normal mode bosses are very easily solo'ed by a 373-MM hunter (lower could do it too). Just camouflage past all the trash in the instance. I didn't bring any buff food or potions. Just use Deterrence and/or Feign Death to prevent damage from Chilling Breath. Shadowmeld does not seem to work. It takes about 8 minutes per run so I do have issues reaching the 5 instance/hour cap but that gives time to take a quick break between farming runs. If you fail to prevent damage from too many Chilling Breath (i.e. FD too slowly) just dismiss pet and FD to reset him. After you kill, jump off the edge of the platform to be brought back to the beginning of the instance. Good luck mount farming! Altairus Boss Strategy, the second boss in Vortex Pinnacle. I can't wait lintel MoP when you can most likely just kill this guy in normal mode forever lintel it drops. I've been soloing as a BM hunter. Standard DPS spec. Mostly raid finder gear with a few 397 and a few 378. I stealth past most of the mobs, but deterrence and feign past the immediate trash before Altairus, reason being so I don't have to wait on the camo cooldown, after the orbs that need to be attacked. Pet is spirit beast, with /cast Spirit Mend macroed onto Rapid Fire. Usually it goes off shortly after the first blast. Spirit Mend every blast so I remember to keep it up, as the Spirit Beast's health will fall pretty fast if I'm not careful. For the most part, the Spirit Beast is able to keep me alive, and I'm able to return the favor. I've had my share of close calls, however, so I'd advise having a similar or greater gear situation to me before attempting. It's fairly simple now to do as Marksmanship, especially using a solo spec, but I wanted to contribute my success as BM, in case any other BM hunters are interested. Definately an Assassins Creed Reference. I've just started farming this as a Blood DK. After 19 runs, still no drop for the mount, buts its just a start ! FINALLY downed this guy. It took me 1 min and 50 seconds to kill him. He was a challenge for me. I switched to BM spec, and used a spirit beast for heals and damage buff. When he would face me for chilling breath I would FD, you have to make sure you pop it fast enough so he doesn't cast chilling breath at all. However, he will cast it again before FD has cooled, so for the 2nd chilling breath I used deterrence. The 3rd CB will hit you, and for the 4th my FD had cooled. No mount though. :( Time to go try it all again. I could have done without the 124g 25s 6c repair bill afterwards though. Since I have the strategy down now I should be able to kill him on the first try. The rest of the instance was pretty easy to solo. Consider using the so-called "Extreme Soloing build": http://www.warcrafthuntersunion.com/2011/04/extreme-soloing-hunter-spec/. BM does have a nice self-heal, but MM gives you an additional round of oh-crap buttons from Readiness. Taking the damage and healing back up. Rotating through those methods will significantly limit the number of times you have to take the damage and, if you spread them out appropriately, you can be close to full health from your self-heals each time you don't have a cooldown available. For instance, by taking the damage from the first breath before you start using cooldowns, your Chimera Shots or Spirit Mends won't be wasted overhealing. Setting your pet at the middle of the top of the stairs will give you a good clean pull so you can stand in the back and easily get to three of the four upwind buffs. When the wind is blowing from the opposite side, I generally don't bother running across the room to get upwind. Another thing to know is that Trueno Furioso, Espada Bendita del Hijo del Viento IS helpful for bosses that their main damage output is their melee swings. The debuff slows their attack speed by 20% and will help out a lot in that sort of fight. Is it just me, or is WowHead saying that I can pickpocket his stomach? the fastest class to farm this would a rogue as he can just skip through all the trash mobs. 2nd would a druid as well. the 3rd class would be a hunter and a mage. if you can take a lot of hits, dismiss the pet, run to the boss, feint death or invisibility to lose all aggro from all the trash mobs. for all other classes, you will have to kill your way to the boss. You can do 5 times per hour. so far i have done 30 times with my rogue and still counting. I will keep the update. This is a comment on benx2011 post. Since my rep is not high enough yet I need to add a new comment. So I am doing this farm on my hunter and the whole instance takes less than 5 min. level 90 BM Hunter. I decided to start farming this mount 12 days ago and 171 runs. So far no mount, but I am still very hopeful. I just wanted to combine some helpful tips into 1 guide for hunters attempting this. 2. Camo past all mobs. 4. use "Readiness" to refresh camo after you become uncamo'd for orbs. 5. When killing Altairus keep the wind to your back and he goes down much faster. 6. After you kill Altairus jump off the platform and it will bring you back to the start of instance. Will Keep you updated on the # of runs, and when successful. This, along with Stonecores Slabhide, is now incredibly easy farmed as they drop mounts in normal mode. I spent two days getting both. No biggie. And there's more uncounted runs on top of that from when it was current content and i never saw it. Will update as I continue to grind it. As a hunter I can complete a run in just over 3 minutes, but even being able to do 5 runs very fast it's getting v annoying at this point. Finally got it at run 340. I'm actually farming this dungeon and to break the monotony of these rushes, i'm just trying to beat my timescore of the run each time(tracked by oqueue), which add a little dose of fun. 3min22 as a rogue is my best score so far. Know people hate hearing this, but got in my 7th farming attempt. Of course I've done this place about 30 other times not farming as well. I can confirm, that he dropped me today at 4th solo run with my 100 lvl mage, just nuke. WTB mount who looks like this and doesn't have that stupid armor on it's head. Why is this not an option? 3 mins 12 seconds is my best so far on a monk, I love this dungeon, it is so stunning. I hope to get the mount soon. Riendas del draco del Viento del Norte mount drops from Altairus in the La Cumbre del Vórtice on either difficulty. Altairus es el segundo jefe en La Cumbre del Vórtice. Es un dragón de tormenta y se lo puede encontrar en la Subida del Nimbus: la segunda de las tres plataformas de la mazmorra. Llamar al viento – Altairus periodically calls to the wind, creating a constant wind in one of four cardinal directions. Depending on the direction of the wind, the player's location, and Altairus' location, the player receives either the Upwind of Altairus effect or the Downwind of Altairus effect. Viento a favor de Altairus – If the prevailing wind blows over the player before reaching Altairus, then the player has their attack and casting speeds increased by 100% and movement speed increased by 30%. A contraviento de Altairus – If the prevailing wind blows over Altairus before reaching the player, then the player has their attack and casting speeds decreased by 100% and movement speed decreased by 30%. Aliento escalofriante – Altairus chooses a random player, then turns and casts a Chilling Breath in their direction. The breath inflicts 47 Frost damage to all enemy targets in a frontal 120 degree cone from Altairus. Explosión de relámpagos – Any player not standing on Altairus' platform is blasted with an immense blast of lightning, inflicting (100% of Spell power) Nature damage. Vientos giratorios – Altairus' platform fills with fast moving twisters. Any player that touches a twister is dealt (100% of Spell power) Nature damage and knocked straight up.